Moisturize and Protect Daily to keep skin healthy and hydrated. Dehydrated skin should be a concern for incontinent individuals and their caregivers. Dehydrated skin can be only temporary, or it may be a lifelong condition or concerns. However, when skin loses its natural moisture, and becomes dry, it becomes more susceptible to breakdown, chaffing, cracking, and infection. Skin health is an important factor in proper incontinence care. A lot of factors can contribute to dry skin. It is important to recognize what increases the risks of dry skin, and take steps to prevent or correct such situations. Genetic predisposition. Some are more disposed to getting dry skin, their body may naturally not produce as much sebum and other oils to keep skin moist. When this is the case, it is important to regularly use a moisturizer to help keep skin healthy and hydrated. Stress. High levels of stress can lead to dryness of skin. For an incontinent individual, worrying about leaks can lead to stress. Choosing the right products and finding the right fit will help eliminate stress, and help promote healthier skin. Use The Incontinence Product Finder to help sort through the wide variety of absorbent products and incontinence helps offered by The Caregiver Partnership. Wind. Wind can dry skin out, if you will be outdoors in a windy situation, use clothing, hats, and possibly even a moisture barrier to help protect the skin from losing natural oils. Friction. Like the wind, too much friction can lead to dried out and dehydrated skin. Reduce friction for incontinent individuals by using no-rinse formulated cleansers, and choosing products that fit well. Exposure to certain chemicals or inappropriate products. There are chemicals and products that dry the skin out simply because they are not formulated for the sensitivity of skin. Soap, for example, can leave skin dehydrated. Be careful what you put on your skin, look for options specially formulated for your condition and needs. Overburdened defense system. When the body’s natural defense system is overburdened, the skin shows the first signs of it. Dehydration is a natural result. Aging. which can cause the depletion of natural oils in skin. As skin ages it produces less of the lipid-based sebum, which helps keep skin healthy and hydrated. What can you do if you have dehydrated skin? The solution is to moisturize and protect the skin. This can be done by choosing the right products, and following a skin care regimen. 1. 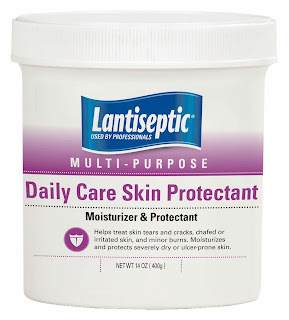 Moisturize and Protect regularly with Daily Care Skin Protectant to keep skin healthy and hydrated. 2. 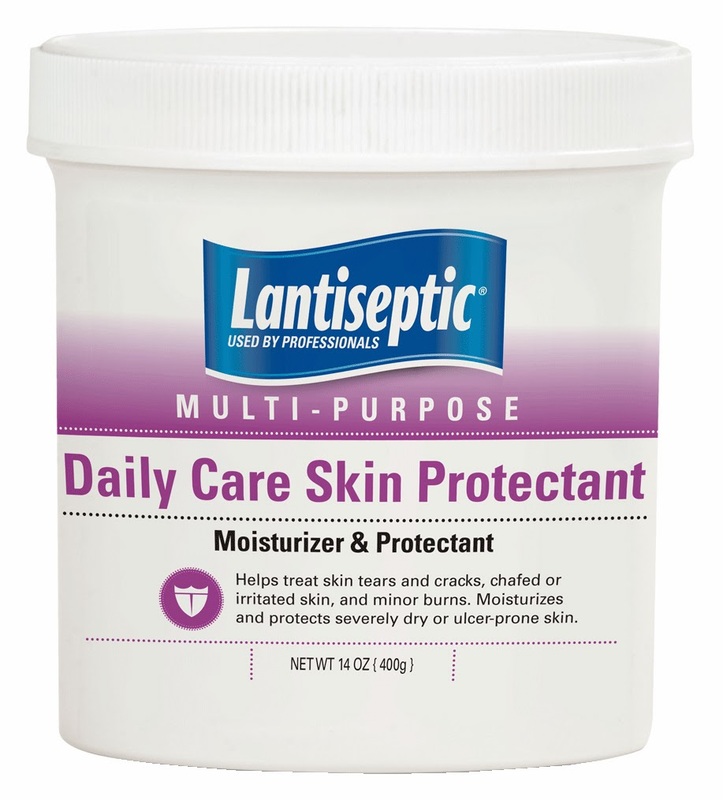 Protect as needed with Lantiseptic Skin Protectant to create a superior environment for the healing process. Learn more and order Lantiseptic products, the #1 brand recommended by professionals. Be careful not to expose it to anything that can increase dryness. 1. Don’t wash with soap and water. Because incontinent individuals should be washing their skin with each change of an absorbent product, soap and water will not cut it. It can lead to dryness and irritation. 2. Change products frequently to keep skin from having prolonged exposure to wetness. Prolonged exposure can cause skin breakdown and infection. Choose a healthy diet, and stay hydrated. 1. The skin often reflects what is going on inside the body. If you want healthy skin, eat a nutritious diet full of vitamins, minerals, and nutrients. 2. If the body is dehydrated, the skin will be too. Drink up! Many incontinent individuals avoid drinking too much in order to reduce their accidents, but it can have the opposite effect, making incontinence worse, and hurts the skin. Get plenty of water each day.